The Lightbox has seen a 27-per-cent decline in attendance from 2015 to 2016. You can feel it in the air: the knives are out for the Toronto International Film Festival. We all sensed it during the 2017 festival: the grumbling about Festival Street, which reroutes streetcars for “brand activations”; the malaise over the lineup, with Telluride and Venice once again scooping the highest-profile premieres; the prices, which have never been higher; the Variety article stating that the festival “feels smaller than ever” (published only one year after they reported that it had grown too big); and the much-buzzed-about Globe and Mail exposé, which depicted an organization struggling to adapt to redefine its identity in a changing landscape. Nowhere are TIFF’s problems more apparent than its Lightbox—the great white hope of Toronto cinephilia that is threatening to become a white elephant. The Globe‘s revelations were blunted by an earlier, more sympathetic Toronto Star article, which laid out the sad facts: Lightbox attendance dropped 27 per cent from 2015 to 2016, and that TIFF would “hit the pause button” on its gallery shows. Citing competition from prestige TV and online gaming, TIFF’s strategic plan states, “Our main competition used to be film. Now, our main service must be transformative experiences through film.” (As one wag put it, “Imagine this line in any other industry: ‘Our main product used to be cheese. Now it must be transformative experiences through cheese. 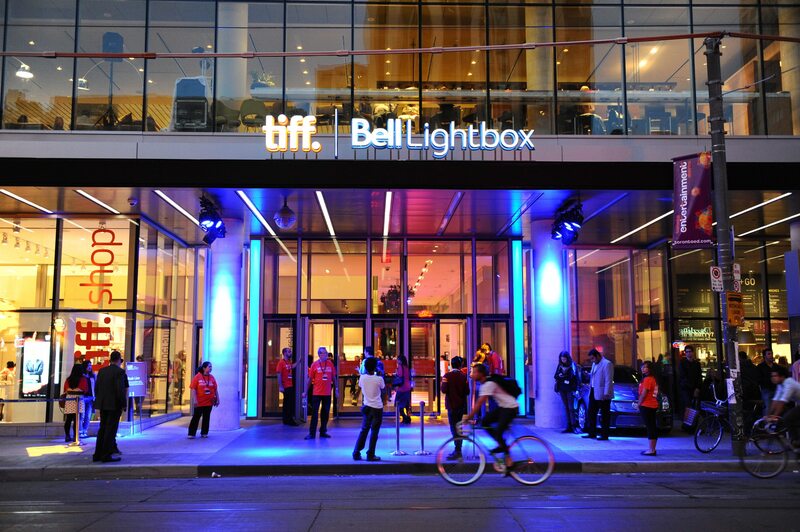 '”) To the Star, TIFF’s executives predicted that the Lightbox’s future would depend more on educational programs and “expanding online services that fully exploit the festival’s vast curatorial expertise.” The article bore the ominous title, “TIFF sees less film in its future.” None of this, in my humble opinion, indicates an organization any closer to solving its identity crisis. The Lightbox had the misfortune of opening in 2010, at the exact moment of a massive sea change for film exhibition. With the switchover from 35mm to digital projection, and the increased commonness of day-and-date theatrical/VOD releases, there is less urgency about seeing a movie in a theatre. Even so, people still like to go to the movies. It’s true that TIFF must focus on “experiences,” but they should look at how Toronto’s other repertory cinemas have adapted to the times. Look at the Royal, with monthly series like Ladies of Burlesque (which pairs classic films with live burlesque performances), Neon Dreams (80s cinema), Retropath (classic horror/cult movies), and Laserblast Film Society (underground/exploitation oddities). Look at the Revue, with Designing the Movies (fashion in cinema), and series devoted to anime and silent films. Look at the feminist film programs that have sprung up: MUFF Society (Carlton), Bechdel Tested (the Revue), and Drunk Feminist Films (the Royal). These events are presented with introductions, contests, and live entertainment, and are curated by visible programmers who develop a rapport with the audience, building trust for more obscure and eccentric screenings. There’s no reason why the Lightbox can’t create series and cultivate audiences like these. What it requires is reaching outside the TIFF bubble, connecting with Toronto’s already-existing film community, and ceding some control to programmers who can bring a sense of authorship to their screenings. It’s no coincidence that one of the Lightbox’s 2017 highlights, a screening of Year of the Dragon, was sold on the fact that it featured a 70mm print and was hosted by (regular Torontoist contributor and my good pal) Jesse Hawken. TIFF’s new partnership with MDFF—the independent-film screening series curated by filmmakers Kazik Radwanski and Daniel Montgomery—is a step in the right direction. TIFF’s head-honchos often note that a $14 Lightbox ticket is a cheap night out compared to an opera, a Soulpepper play, or a Lady Gaga concert. This is indisputably true, but it’s also true that a movie is a movie, and a night out is not necessarily preferable to watching a movie on my own comfortable couch. It’s hard to muster much enthusiasm to pay $14 for a $7 iTunes rental, or a classic movie on a digital print that I already own on Blu-ray. However, I am inclined to see a classic movie on 35mm, because this is a privilege I cannot get at home. My questions: why should a digital screening cost the same as 35mm? And why not follow Cineplex’s lead and implement cheaper Tuesday pricing, which would at least get more foot-traffic and buzz in Lightbox’s vast, barren lobby during mid-week? Building a repertory cinema in the entertainment district probably seemed like a good idea back when TIFF made its deal with the Reitman family. Now, it’s stuck with a building far away from where most of its desired “millennials” live. TIFF can’t easily solve that problem, but it can make the Lightbox a more welcoming space for those millennials to travel to. When I enter the Lightbox, I’m immediately alienated by the Canteen restaurant and Luma Lounge—flavourless, middlebrow spots for King Street condo-dwellers, wealthy opera patrons, and tourists who wander up John Street after a baseball game. These are not the same audiences who see movies, and the Luma Lounge especially feels outside my pay grade. If TIFF is looking for something to do with its defunct gallery space, why not build or rent to a cheap bar where the coveted “millennials” can hang out? The kind of bar that has become the bread-and-butter of successful rep theatres in the United States? The easiest way for TIFF to get people out for its rep screenings is to make it easier for them to know when the screenings are. Did you know that the Lightbox recently ran a series of classics by Ozu, Bresson, and Dreyer on beautiful 35mm prints? Other rep cinemas get big audiences for classics with the lure of 35mm—why doesn’t the Lightbox do more to promote this advantage? And speaking of promotion, why do so few of these screenings have Facebook events, where the coveted “millennials” can see which of their friends are going? Why doesn’t TIFF release a monthly screening calendar like the Royal and the Revue? A big, unwieldy three-month calendar comes with their seasonal program guides, but why not something I can put on my fridge? And hey, while we’re at it: why, after all these years, is it still such a chore to navigate the TIFF website? With all that said, let me tell you about two of the best moviegoing experiences I’ve ever had, both at the Lightbox. In 2016, I saw Andrei Tarkovsky’s Stalker. It’s the kind of “canonical” title that I sometimes need the prodding of a rep screening to see; it has visual texture that benefits from being seen on 35mm film; and it’s the sort of immersive mesmerizing, experience that benefits from being seeing in a theatre and shared with an audience. This summer, I saw one of my favourite movies, John Woo’s Hard-Boiled, at a sold-out midnight screening hastily organized for its 25th anniversary and introduced by former TIFF programmer Colin Geddes, who curated a pre-show. Seeing it late at night with a full audience—divided almost equally between Woo fans and neophytes—gave it a charge of electricity. Neither of these experiences can be replicated at home. Both screenings attracted “millennials” without desperately pandering to them. At its best, the Lightbox already offers “transformative experiences through film,” and recognizes that “film” is not something to run away from. The audience is already there; all TIFF needs to do is activate it.